Newly redeveloped, all natural soap-free foaming cleanser. 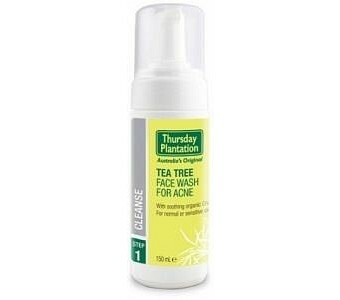 Aids in the prevention of acne and pimples by gently cleansing the skin to remove oily build-up on the skin. Features and Benefits Contains naturally derived ingredients Contains 100% pure Tea Tree Oil Contains Chamomile to soothe the skin. Soap free to avoid excessive drying of the skin pH balanced to minimise stress to the skin New convenient, economical foam pump pack Benzoyl Peroxide-free for fewer side effects Free from parabens, petrochemicals, propylene glycol, laurly sulphates, polysorbates, synthetic fragrances, synthetic colours and animal derived ingredients Directions For external use only. Wet face and gently massage into skin, avoiding eyes. Rinse well and pat dry. May be used daily. Duration of Use No restriction on duration of use. CAUTIONS AND CONTRAINDICATIONS Always read the label. Use only as directed. Discontinue use if sensitivity occurs. Do not use internally: this product has been designed for external skin application Do not use near eyes: avoid contact with eyes. Seek medical attention if contact occurs Medicine Interactions Do not use with other acne treatments due to possible unknown interactions.